The Clampetts were lucky. They struck gold, packed everything on a wagon, and headed West. I am not envious of the black gold – Texas tea (much), nor the West, but the part about throwing everything they own on the back of a truck as if it were a game of Jenga, securing it with rope and simply heading in the right direction would be an improvement over what we are going through right now. The keywords here is “they”. E. and I have pretty much had to relinquish control over most of our belongings to others, to “professionals”, and keep in mind, we are both what pop psychology calls “type A personalities”. Oh, how I enjoy packers placing my belongings into boxes and hauling them away for two years to a storage facility to which I will have no access! I watched packers wrap our plastic cereal bowls as if it were precious China, since they charge us for packing materials. They packed my broom before I had time to notice it was gone, before I had time to sweep the full box of laundry detergent powder that had fallen open onto the garage floor. Today, I watched another set of movers pack bundles of clothes, wrapped in brown paper, to be later stuffed in a crate. They repeated the gesture with bundles of toiletries, books, a desktop and two pairs of shoes still in the box. We had been told the movers would be very efficient. I had assumed the shoeboxes would be filled with items such as socks, to consolidate, that shoes themselves would be filled with smaller items such as toiletries (my mommy taught me that). My definition of space efficiency is different and involves 3D visualization. I doubt that was done. I could have doubled the merchandise we are taking if I had been aware of their (non) system. Which, after all, is a good thing since I am trying to simplify, minimize, de-clutter, zen-ify our new life for Bangalore. We are tired, exhausted and but all around excited! 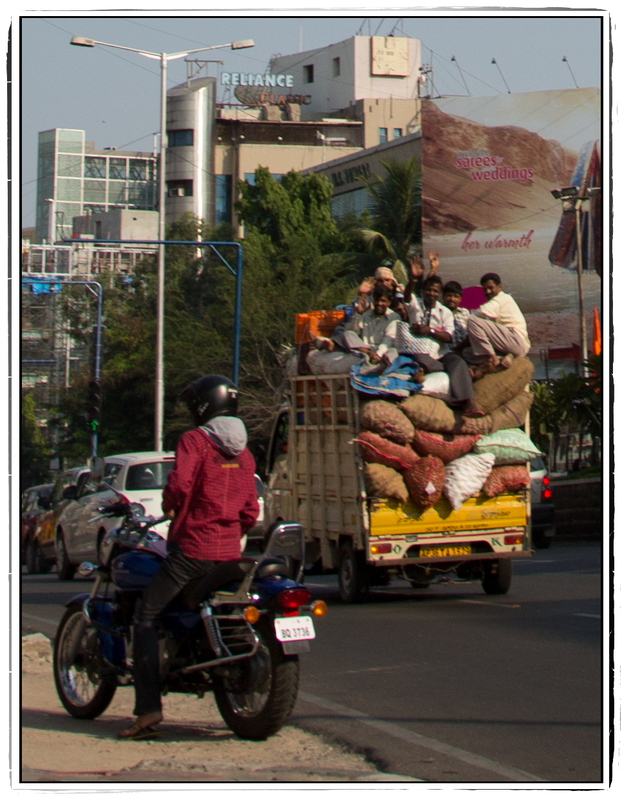 This entry was posted in Preparing for the trip, Street photography and tagged Bangalore, Begumpet, Beverly Hillbillies, Clampetts, declutter, expat, Hyderabad, India, movers, moving, simplify, storage, street photography, zen. Bookmark the permalink. I just went through the same. It’s better living more simply, but it’s a pain getting it all done. The joys of moving. I learned my lesson last year with the movers that if it’s not permanently affixed to the house, it will be boxed and shipped. I had so much junk arrive in my shipment to Saudi Arabia. Good luck! With each passing day, you’re getting closer to Bangalore. You need your own blog!